'Juniper Cobra' exercise simulates real-life scenarios - including the threat of multiple air and missile attacks from north and south. 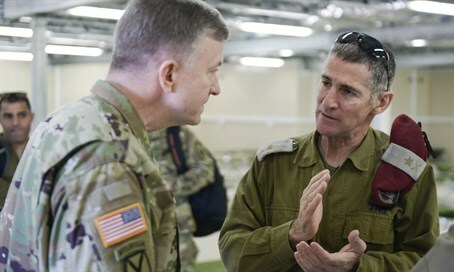 Senior Israeli and American military commanders took part in a major air defense exercise in Israel over the past several days, underlining the strong - and strengthening - ties between the IDF and the US army. Juniper Cobra (JC-16), a combined ballistic missile defense exercise, comes at a crucial time for Israel in particular. Despite major differences in opinion between Washington and Jerusalem over the wisdom of the Iranian nuclear deal, both countries' militaries are on the same page regarding the threats posed by an Iranian regime whose ballistic missile program has continued at full-throttle regardless of any deal. The exercise was modeled around realistic scenarios, including a simulation of a multi-front air and missile assault on Israel, and was led on the American side by Lt. Gen. Timothy M. Ray, Commander of the USA Third Air Force, who hailed the "historic" ties between the Israeli and American militaries. On the Israeli side, Brig. Gen. Zvika Haimovich, Commander of the Israel Air Force's Aerial Defense Division, described the major advances Israel has made in air defenses since the 2006 Second Lebanon War. "I think that these were crucial years. During the course of this period we experienced Operation Pillar of Defense and Operation Protective Edge (in Gaza), and we have also significantly improved our defensive and offensive capabilities" drawing from the lessons learned in those operations, he said. However he acknowledged that Israel's foes are also learning their own lessons and making their own advances. "On the other hand, the threats will also become more significant," making such operations all the more crucial to maintaining the IDF and IAF's qualitative edge "against threats from the north and south, and also against simultaneous threats." Haimovich warned, however, that "there is no hermetic defense" against the threat of rockets from Hamas, Hezbollah or other Islamist terrorists - but he vowed that the IDF would do all it could to minimize the damage Israel's enemies seek to inflict upon it, as it has done during previous conflicts. Haimovich also related to the Israeli air force's coordination with Russia over the skies of Syria. Israeli jets are believed to have carried out numerous air strikes against Hezbollah and regime targets, as part of measures to prevent the transfer of "game-changing" weaponry from Iran and Syria to Shia terrorists in Lebanon. Under an agreement between Israel and Russia, Israeli jets are free to operate unobstructed over Syria, while Russian aircraft have been granted permission to cross into Israeli airspace unhindered when necessary. "The Russians are not an enemy of the State of Israel, the IDF or the air force," he said, highlighting how Russian cooperation has ensured "Israeli freedom of movement." "I think that each side respects the other."